Looking for some yard games to play? Check out this deal I just found on Walmart. They are offering this Giant Wooden Yard Dice for $15.99! 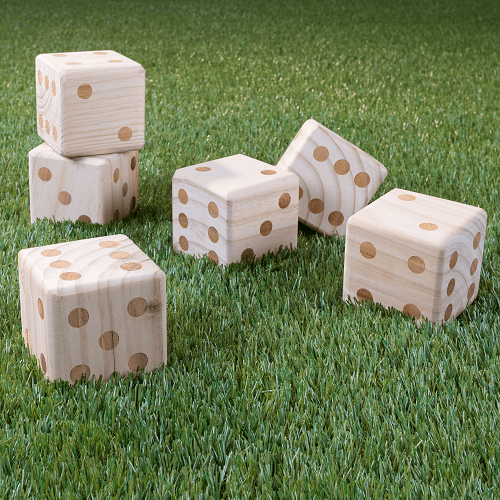 EASY AND FUN TO USE The Giant Wooden Yard Dice are easy and fun to use. You can toss one at a time, or toss them all together, depending on what yard game youre playing. When your game is finished, they store nicely in a nylon carrying case, so you can easily take them to your next outdoor lawn game. MADE OUT OF QUALITY PINE WOOD These wooden dice are hand-crafted out of soft pine wood, with the pips heat branded into the wood, so they will be marked for the life of the dice. The dice are hand-sanded with beveled edges so they are soft and easy to use without hard edges or splinters. INDOOR OR OUTDOOR USE Because pine wood is softer, these can be used indoors on carpet or rugs, as well as outdoors, by kids and adults, in small groups or larger family games. PRODUCT DETAILS 6 large wooden dice measuring 3.5 x 3.5 x 3.5 and includes an easy-to-close carrying case. SATISFACTION GUARANTEED Hey! Play! is committed to providing consumers with the absolute best price and value on our entire line of products. NOTE: This is an exclusive product of Hey! Play! and ONLY outdoor games by Hey! Play! are GUARANTEED to be genuine.